If July was any indication, Portland's residential real estate market is as hot as it's ever been. all-time record for July closings in Portland. also saw inventory tick up slightly to 1.7 months, with the total market time creeping up to 45 days. the median price was up to $304,900 from $284,900 last year. “If sellers are market ready and priced right on day one, they will sell the first weekend," he said. “If you’re looking to purchase a home, the next two-and-a-half months will be critical," he said. People's seemingly boundless hunger to live in Portland, especially its bike-friendly eastside grid, will keep the apartment construction market booming in 2014, a local real estate expert says. But that'll keep rents from rising quite as fast as they have been, he predicted. "It looks like 2014 will again be all apartments, all the time," Greg Frick of HFO Investment Real Estate said in a talk at the Multnomah Athletic Club, echoing his firm's motto. The surge of new units entering the market, he added, will probably drive up vacancy rates slightly and slow the rise of rents. Market-rate rents will probably grow a bit more slowly than the 6.6 percent hike the area saw in 2013, which was the third-highest rent increase in the country. The Real Estate Beat is made possible by real estate broker Lyudmila Leissler of Portlandia Home/Windermere Real Estate. AS THE SPRING home-selling and buying season commences, most good news lies in the future. How far? Nobody knows for sure. Yet if you scan our annual real estate grids with a magnifying glass, positive stories can be found: neighborhoods seeing upticks in value, median ages going down, median income going up. And last year, the number of homes sold actually increased by more than 8 percent in Portland and by 12 percent in its outlying suburbs. In neighborhoods that saw double-digit percentage price drops in home values—like the Pearl, Hillside, and Cathedral Park—sales increased by as much as 80 percent. According to Gerard Mildner, director of PSU’s Center for Real Estate, these trends should inspire some cautious optimism for the future. But the best news, Mildner says, is that the housing bubble made us wiser—and long-term investments may begin to trump opportunistic buying. Finding that perfect neighborhood is tough—but we’re here to help. Download neighborhood and suburb stats on everything from the number of renters and frequent bus lines to school report card grades and park sizes. The major movements within Portland's real estate market, from cash purchases to sustainable mixed-use developments. Andy Ricker’s Pok Pok might have captured the culinary heart of Division, but seven-year-old Urban Development Partners has claimed something more tangible—land. The development firm owns six properties on Division, between 31st and 39th, among them the Reliable, a LEED Gold-certified building with 13 residential units hoisted atop popular eateries like the Sunshine Tavern and Wafu. UDP came to Portland in 2006, after transforming Oakland’s historic Mutual Creamery building into 26 live-work spaces. Division immediately caught their eye. “When the city puts investment or intention behind an area—with tax incentives, up-zoning, even just cleaning up the streets—it’s a recipe for reinvention,” notes cofounder Eric Cress. The firm’s first Division Street building, the Richmond, opened in 2008, anchored by the Victory Bar. Next came Reliable, in 2010, followed by a 26-unit LEED Platinum mixed-use building at 38th and Division in 2011. Up next: a 39-unit building at 3339 SE Division St, slated for completion this fall. (Salt and Straw and St. Honoré have already signed up for ground-floor retail spaces.) And in 2014, UDP will debut two more mixed-use projects at 3360 and 3330 SE Division St. When the Portland City Council approved waiving system development charges and upped the maximum size of Accessory Dwelling Units (ADUs) to 75 percent of the main house in April 2010, the number of completed backyard cottages grew by more than 30 percent: from 52 in fiscal year 2009 to 70 in 2010 and 104 in 2011. The savings—typically several thousand dollars per dwelling—helped encourage a wave of these backyard bargains, but so did the emergence of an übertight rental market. And since the city voted to extend the waiver for another three years, look for more of these charming cottages coming to a backyard near you. In Portland’s low-inventory real estate market, money doesn’t just talk—it screams. Fully a quarter of all home purchases made in 2011 and 2012 were cash purchases. No financing, just dollar signs. “It’s basically investors getting into the market,” explains Jerry Johnson, principal at Johnson Reid real estate consultancy firm. “They see huge buying opportunities. When cash buyers come in, it typically means they’re reading bottom of the market.” It can be good business for builders, as Keller Williams principal broker Nick Krautter points out: “You can pay $250,000 to $300,000 for a house, tear it down and build another, and still make money,” he says. “That wasn’t the case two years ago.” The proliferation of cash buyers can be frustrating for buyers looking to finance a home, since cash deals are often more attractive to sellers. Krautter relates the story of a recent listing in the low $300,000 range that garnered six offers within 48 hours, all well above the listing price. Two of them were cash offers (and one of those won out). “Sellers are really looking at the bottom line,” he notes. But as the number of foreclosure properties on the market continues to decrease, Michael Hasson of Hasson Company Realtors expects to see cash sales level off. In the rent-controlled Big Apple, where vacancy rates regularly dip below 2 percent, and competition for the city’s apartments verges on all-out warfare, employing a leasing agent to hunt down a rental is about the only way to ensure you score a dream (or at least cockroach-free) apartment. With similarly low vacancy rates here, it was only a matter of time before the practice arrived in Portland. “We’ve found the need and request for rental location service to be increasing as the rental market continues to be competitive,” says Jenelle Isaacson, founder of the fast-growing firm Living Room Realty. So the firm, along with a few others, began offering “relocation services.” For a $500 deposit (applied toward your total fee—one month’s rent once you find an apartment) a Living Room agent will research, preview, and photograph potential properties for you. Goodbye, Craigslist. Hello, home. When the market crashed, many called the city of Happy Valley "Death Valley" because of all the vacant homes and overgrown yards. Now, I'm seeing clients that like the lower price per square foot, views of city and mountains, and one of the top school districts in the Portland Area. The prices have remained relatively stable this week in the Happy Valley area with the curent median list price is $389,900. Check out this article from last Sunday in The Oregonian. Heidi Caniparoli counts her family as one of the lucky ones. It took time and effort, but they, like her town's housing market, are coming back. The Caniparolis have a home again. In Happy Valley, one of the Oregon cities hardest hit by the housing crisis, default notices and building permits are back to the pre-recession levels of a decade ago. The Caniparolis, along with local homebuilders and city officials, feel they've turned a corner. Happy Valley was booming in 2005. The city of about 15,000 people was building twice as many homes as the year before. Caniparoli was happy in her large home, which fit her, her husband, three teenagers, her mom and her mother-in-law. The Caniparolis had a big backyard, and things were good. Until her mother in-law died suddenly. Without the extra income she was paying in rent, the mortgage became something the family couldn't afford. "We hung onto it as long as we could, but the market was changing in Happy Valley," Caniparoli said. The market was changing everywhere. Foreclosures skyrocketed and new construction halted in Happy Valley. With such a boom in the early 2000s, the housing crash shook the city's foundation. "Happy Valley just became a ghost town. All of the foreclosures and for-sale signs. There was no new construction at all," Caniparoli said. The town went from having 572 homes built in 2005 to just 70 in both 2009 and 2010. Meanwhile, the neighbors who remained were beginning to get default notices on their home loans. The county sent out about 850 notices in 2005. That ballooned to almost 3,700 by 2010. The Caniparolis had a lot of competition when they listed their home. Their house was one of many with a sign stuck in the grass out front. They bought their home for $450,000. Over the few years they owned it, they put more than $30,000 into it. Their real estate agent told them the improvements weren't enough to sell the home in such a tough market; they needed to add new carpeting, new granite countertops and paint the walls of the 3,600-square-foot home. They did. They were told to paint the outside of the home too, but couldn't afford to. "We were competing against so much. It made it so hard to sell," Caniparoli said. The family fell further behind on mortgage payments and worried about losing the house altogether. After a year with no sale, foreclosure seemed to loom, and they started talking about a short sale. "Then we all of a sudden got a buyer," Caniparoli said. "It was a huge relief." A huge relief, but the Caniparolis lost money. They invested $480,000, and the house sold in October 2008 for about $485,000. When you take out the real estate agent fees and other expenses, "we lost everything," Caniparoli said. The family then moved into an apartment and struggled to adjust to their new way of living. An apartment was an embarrassing step down from ownership. A down payment on a home seemed far off, as did restoration of their credit score, which needed boosting after some late mortgage payments. The family took time to recover. So did Happy Valley. By 2010 the Caniparoli family began looking into buying a home again. The city too seemed to get a little more hopeful. The contractors who were left in town — and there were only a handful — began building a few homes at a time and selling them. The grocery store parking lot stopped looking so desolate. Once again, Caniparoli battled a little traffic on her way to work. With a low credit score and one child off to college, money was tight. Then she found Tony Marnella. Marnella owns Monza Homes, one of those few builders still left in Happy Valley. He offered the Caniparolis the option to lease the townhouse they wanted to buy while they saved up for their down payment. The family moved in February 2010 and bought the $260,000 home in August that year. At that point Marnella too was coming out of his low point. He bought the company in 2007 when the market was good. By 2009 he was selling the homes he built below cost. Two years after that he sold eight homes. Last year he, like Caniparoli and the city, began to really see the comeback. He sold 18 homes. Not his best year. Not his worst. By some measures the city's housing market is back to what was normal before the boom years of 2005-06 and the subsequent crash. Default notices are on par with 2003 numbers; fewer, actually. Building permits are returning to 2003 levels too; more, actually. The city's building official, Matt Rozzell, said it's been slow and steady growth, although faster than in surrounding towns. "Happy Valley is a great community, and it's exciting to see it come back. We got hit so hard, so early. It was Unhappy Valley," Marnella said. Home prices are still far off the highs of six or seven years ago. About 1 in 8 Happy Valley homeowners are delinquent on their mortgages, and many more are underwater. But Marnella and the Caniparolis say the worst is over. For Caniparoli, leaving Happy Valley was never an option. Her husband went to North Clackamas schools. Her kids are established there. They love the city. And now they don't have to worry about their landlord selling their living space and kicking them out. They don't have to ask someone whether they can paint the walls. They're home again. We are seeing a lot of evidence that the market has turned the corner. The sales of already occupied homes on the rise, while the inventory of unsold homes is back at pre-crisis lows. Please visit "market sales trends" page on my website to view each county's latest trends. Steady December home sales capped the best year for the U.S. real estate market in five years, according to an industry trade group report Tuesday. The National Association of Realtors said that December sales of previously-owned homes came in just slightly below November's sales pace, but up 12.8% from a year ago. That brought full-year sales to 4.65 million, up 9% from 2011 and the best year for home sales since 2007, when there were 5 million homes sold just before the start of the recession. Sales are being helped by a combination of strong market fundamentals — near record low mortgage rates, lower unemployment and a rebound in home prices, all of which are bringing in buyers into the market who had been waiting for it to hit bottom. The mortgage rates and years of depressed home prices have also combined to create the most affordable housing market on record, according to the Realtors group. 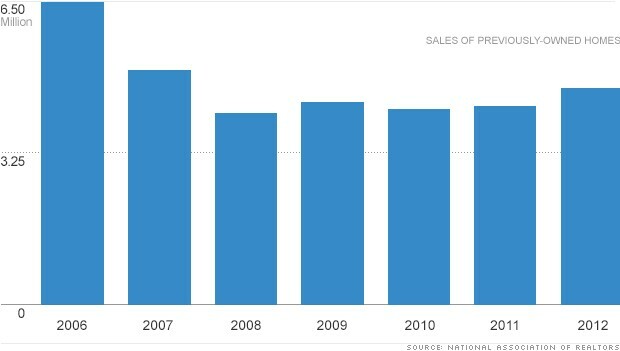 And the Realtors are predicting strong sales should continue into 2013 and beyond. It has a forecast for 5.1 million existing home sales this year, and 5.4 million next year. The improved demand for homes in December led to the inventory of homes for sale to fall to 1.82 million homes on the market, the lowest supply since January 2001. One factor in tightening supplies is a drop in foreclosures and other distressed home sales, which made up only 24% of home sales in December compared to 32% a year ago. The tighter supply, and the drop in distressed sales, have helped to lift home prices so that the median sales price for the year rose to $176,600, up 6.3% from 2011. That's the biggest gain in prices in since the bubble year of 2005. The rebound in the market for previously-owned homes is also showing up in the market for new homes, where sales rebounded to their highest levels since 2009, while housing starts reached the highest level since 2008. Will the rates stay low? has been trending up. Though days-on-market is increasing, these are mildly positive indications for the market. Let me know if I can provide you with any specific information. By Inman News, Thursday, January 3, 2013. Mortgage rates remained near historic lows this week, but more than eight out of 10 home loan applications submitted in recent weeks have been for refinancings, surveys by industry groups show. Rates on 30-year fixed-rate mortgages averaged 3.34 percent with an average 0.7 point for the week ending Jan. 3, down from 3.35 percent last week and 3.91 percent a year ago, Freddie Mac said in releasing the results of its latest Primary Mortgage Market Survey. Rates on 30-year fixed-rate loans hit a low in Freddie Mac records dating to 1971 of 3.31 percent during the week ending Nov. 21. For 15-year fixed-rate mortgages, rates averaged 2.64 percent with an average 0.7 point, down from 2.65 percent last week and 3.23 percent a year ago. Rates on 15-year fixed-rate loans hit a low in Freddie Mac records dating to 1991 of 2.63 percent during the week ending Nov. 21. Rates on five-year Treasury-indexed hybrid adjustable-rate mortgage (ARM) loans averaged 2.71 percent with an average 0.6 point, up from 2.70 percent last week but down from 2.86 percent a year ago. Rates on five-year ARM loans hit a low in records dating to 2005 of 2.69 percent during the week ending Dec. 6. For one-year Treasury-indexed ARM loans, rates averaged 2.57 percent with an average 0.4 point, up from 2.56 percent last week but down from 2.80 percent a year ago. Rates on one-year ARM loans hit a low in records dating to 2005 of 2.52 percent during the week ending Dec. 20. A separate survey by the Mortgage Bankers Association showed applications for purchase mortgages during the week ending Dec. 28 falling a seasonally adjusted 14.8 percent compared with levels reported two weeks ago. The results included an adjustment to account for the Christmas holiday. While requests to refinance accounted for 82 percent of all mortgage applications during the two weeks ending Dec. 28, demand for refinancings was at its lowest level since April 2012, the MBA said. In their latest forecast, economists at Fannie Mae said they expect refinancings to drop by 29 percent this year, to $956 billion. Refinancings are expected to account for 53 percent of single-family mortgage originations in the final three months of 2013, down from a projected 76 percent in the fourth quarter of 2012. Refinancings are expected to drop mainly because most homeowners who are able to take advantage of low rates have already done so. Fannie Mae expects rates on 30-year fixed-rate mortgages to stay low relative to historical levels, rising from 3.3 percent in the first quarter of 2013 to 3.5 percent in the final three months of 2013. To keep mortgage rates low, the Federal Reserve is buying $40 billion in mortgage-backed securities (MBS) issued by Fannie Mae and Freddie Mac each month. The Fed has said the open-ended program, which also includes $45 billion in monthly purchases of long-term Treasurys, will continue in some form until there is substantial improvement in unemployment. Fannie Mae economists expect existing-home sales will increase by 9.6 percent this year, and that new-home sales will grow by 19.5 percent if the housing recovery stays on track. Recently we have been hearing about various levels of the Housing recovery in the news locally and nationally. While it is 100% happening now, the degree and the pace are still really unknown. As I monitor house values in all areas locally, I find real data to support these national reports. So, maybe good news for us all. Below are the articles you might find interesting. Do you know anyone who may need my help with real estate – personal home or investment property? New-home sales rose in November, recording their strongest pace in more than 2 years, another sign of improvement in the housing market. The Census Bureau reported Thursday that sales of new homes rose to an annual rate of 377,000 in the month, up 4.4% from October, and up 15% from year-earlier levels. It was the highest rate of new-home sales since April 2010, when sales were inflated by a temporary $8,000 tax credit for home buyers. The housing market is now showing numerous signs of improvement, including better existing home sales and home construction. A combination of near record low mortgage rates, lower unemployment and a drop in foreclosures means there are more buyers interested in purchasing, and fewer available homes. That in turn has lifted home prices. Those supply-and-demand dynamics are especially true in the new-home market. There was only a 4.7 month supply of new homes on the market in November, the same tight inventory as has been the case in four of the previous six months. The last time there was a tighter supply of new homes available was in October 2005, near the height of the housing bubble. The tight supply has lifted the median price of a new home sold in November to $246,200, up 14.9% from the comparable price a year earlier. Anika Khan, senior economist with Wells Fargo Securities, said the report was stronger than expected, especially for what is traditionally a slow month for home sales. She said new-home sales and construction are becoming a more important driver of overall economic growth, which is even more important with the economy facing other headwinds such as a cutback on business investment and consumer worries about the fiscal cliff. "New-home sales is a good story and it will continue to be a good story," she said. New-home sales can be more important to the economy than sales of previously owned homes since they require purchase of other goods, such as appliances, and because of the construction jobs needed to build the homes. If you are a first-time home buyer who has been looking for the perfect opportunity to buy a new home, then the time is now. The current real estate market is perfect for everything from buying a new home to investing in the real estate market, which is why first-time home buyers and investors have been going head to head and competing for the best real estate on the market. Why, exactly, is now a great time for first time home buyers to purchase a new home? From incredible deals on foreclosure and short sales to low interest rates and a projection for rising home prices in the future, now is the perfect real estate market for first-time home buyers. If you are a first-time home buyer looking to buy a new home in the current real estate market then you are more than likely looking for the best deals possible. Fortunately, with the number of foreclosures and short sales on the market, you can find discounted properties that are well below market value, which essentially allows for a lower monthly mortgage payment. In fact, with the tax break on short sales that allows struggling homeowners to avoid paying federal taxes on their unpaid mortgages set to expire December 31, there are a ton of short sale properties currently on the market. Therefore, if you are in the market to buy your first home then start looking today, especially if you are interested in short sales and other distressed properties. Plus, with mortgage rates still remaining incredibly low, there is nothing better than for a first-time home buyer to be able to purchase a home below market value and secure an incredibly low mortgage rate. This is the perfect recipe for a low monthly mortgage payment. Some people may be wondering “Why now?” The simple answer to that question essentially revolves around one thing: home prices. Home prices have already started to rise as the real estate market makes progress toward recovery; however, predictions for 2013 include home prices continuing to increase as the real estate market strengthens. Therefore, if you are looking to buy a new home for a discounted price, then do so now before home prices rise. In conclusion, with the high number of distressed properties (including short sales and foreclosures) still on the market and low home prices (coupled with low mortgage rates), now is the perfect time for first-time home buyers to obtain a new home for well below market value and secure a lower mortgage payment. So, if you are a first time home buyer, start your search for your dream home today! There is likely no big price crazy rise in the foreseeable future so your house will most likely appreciate little by little. Great news. Is the Price rise pattern enough to justify “waiting” or “jumping in” – Probably not. Small steady gains are back to the typical real estate appreciation pace – unpredictable always, but historically it seems to be steady 1-4% annually depending upon where you live. If “A” is happening, as the article notes is happening in Portland, then IF you wish to move to a larger or slightly higher priced home, then your future home may be appreciating faster than your current home. 1%-4% of $600,000, in example, is simply more money than 1%-4% of $300,000. In this example , waiting until the $300,000 home is worth about $325,000 (5 years at 2% a year appreciation) means that the “move to” house would then be worth $600,000 would be $649,458.00 at the same 2%. You pay an extra $24,729 trying to “time the market”. But often the area you want to move to may appreciate MORE than the area where you are selling. What an interesting dilemma! We all want to “sell high” and “buy low” but the reality is that simple math does not support that dream we share. The news around Portland is fairly positive. Make sure to notice Portland specific real estate reports. There is a lot of real estate news but actually not a lot of accurate local real estate news. Here is something for you to think about. If you or a friend do want to trade up, I can offer great ideas on maximizing the value of a home to sell while strongly negotiating the best possible price on the next home. My job is to help people catch a bit of the “sell high – buy low” dream. It is nice to deliver some good news once in awhile! Portland home prices increased in September, according to CoreLogic. Portland-area home prices increased 4.1 percent in September compared to a year ago, according to the latest take on the residential market. Santa Ana, Calif.-based CoreLogic reports local home prices performed even better when distressed sales are excluded, rising 4.7 percent compared to a year ago. Overall home sales were up 0.2 percent in September compared to August. CoreLogic said national home prices, including distressed sales, rose five percent in September compared to a year ago, the largest increase since July 2006 and the seventh increase in home prices. CoreLogic said all but seven states posted year-over-year gains. The CoreLogic confirms a separate account by the Regional Multiple Listing Service. RMLS said Portland home prices rose 4.9 percent in September to an average of $281,400. The much-watched S&P/Case-Shiller Home Price Indices report for September will be released later this month. Within the last few months I have seen a steady increase in prices and number of multiple offers on properties. I'm seeing more homes selling within a week and with two or more offers. My feeling is, that we have reached the bottom in most price ranges and will now see more homes coming on the market and selling closer to their asking prices or above. The good news for the buyers is that interest rates are at a historical low. I would suggest that you watch them closely as today you could get a 15 year fixed for 2.7%. It's still a perfect time to buy. Check out an article below. Kitsy Roberts and Janko Williams have traded a rent payment for a mortgage. The Seattle couple is planing to put a lot of seat equity into their fixer-upper. In many American communities, buying a home is now less expensive than renting. And with the economics tilting in favor of homeownership, many first-time buyers are jumping into the market. After eight years of renting, Kitsy Roberts and her husband, Janko Williams, are practically giddy about their new Seattle home. And like proud parents, they are eager to show it off, from its historic details to its fresh paint. The living room of their 1920s bungalow in the city's Central District features a lovely Craftsman-style fireplace and high ceilings. But the house also came adorned with chartreuse carpeting and kitchen cabinets of faux pink marble. Roberts and Williams moved in about a month ago; they've been feverishly fixing and renovating ever since. They're scraping away layers and layers of paint and wallpaper, filling in cracks and replastering. Pointing to the old and not very efficient windows, Roberts sighs and says, "We will probably need to replace these at some point." People buy homes, especially first homes, for lots of reasons. They want more space, a backyard, a sense of privacy and security. And until the housing bubble burst, homeownership was widely viewed as a good investment. Today, buying a house may once again look like a sound financial option, at least in many parts of the country where markets have stabilized, mortgage interest rates are extremely low, and rents are moving sharply higher. "If you are in a stable place and you have the financial ability … it's kind of the perfect time to purchase a home," says Kim Colaprete, part of Team Diva real estate at Coldwell Banker Bain. She helped Roberts and Williams buy their house. The couple — both of them are in their early 30s — had been thinking about taking the plunge into homeownership but hadn't gotten serious. Then they watched as a house in their favorite neighborhood sold in just a couple of days — and for substantially more than the asking price. "I mean, that was sort of it — that one house," Roberts says. "We're going to miss our chance," Williams recalls thinking. They set out to find a real estate agent, and a house of their own. Their new home cost $350,000. Their monthly payment is $1,680, including taxes and insurance. That's about $250 more than their rent. But they'll get some of that back when they deduct the mortgage interest on their tax return. "It beats paying rent," Roberts says. "You're paying for a roof over your head. But after that, you're paying into nothing." Colaprete says she hears the same thing from most of her first-time buyers: They are sick of paying rent, especially since rents have been rising. They say, " 'This is ridiculous, I can buy something with an interest rate of 3.35, or 3.5 [percent]. Why am I paying someone else to have an investment when I can have my own investment?' "
Stan Humphries, the chief economist for Zillow, an online source of real estate and related data, says, "The overwhelming factor in any buy/rent consideration is the time horizon itself: How long are you going to be in that house?" If you are going to be in a house for 20 years, you want to buy the house, he says. "And conversely, if you're only going to be in the house for one year, you're going to want to rent that house, because you won't be able to make up for the transactional cost." Those transaction costs — such as closing costs and commissions — can be thousands of dollars. Historically, Humphries says, the so-called break-even point when buying becomes a better financial proposition than renting has been about four to five years in many markets. Today, he says, in lots of places it's less than three years. Still, there are challenges for many would-be homebuyers. Obtaining a loan can be difficult. And in places like Seattle, there's a shortage of homes on the market — so there isn't much to choose from. But Kitsy Roberts found what she was looking for: a cute house in the right neighborhood, for the right price. "This is pretty neat," she says. "It's all ours."